Occasionally, I share with my clients and recent adult-friends that I was a drum major for three years in high school. Yes, I waved my arms and did a split to signal the start to halftime. If you’d like to see the split, give me three weeks to stretch. Once about 12 years ago, to impress my now-wife, I did the split in front of her and some friends. A new pair of pants and a still lingering soreness in my knee remind me that I’m a lot older and less limber that I was back in those days. I can vividly remember some wonderful moments as drum major. The thrill of my senior year as we went undefeated in the regular season, the awe of the younger fans as we marched into the stadium, and the wonderful camp experiences with a legend in the marching band field, all bring back nostalgia to my aging mind. And, if you go into the archives of YouTube, you will find my salute to former President Bill Clinton as we marched in the 1996 Presidential Inauguration. But the memory that always seems to keep me humble is my first game as drum major. The entire week leading up to the game seems a blur to me now, as 23 years have passed, and I don’t remember much of the remainder of that year. 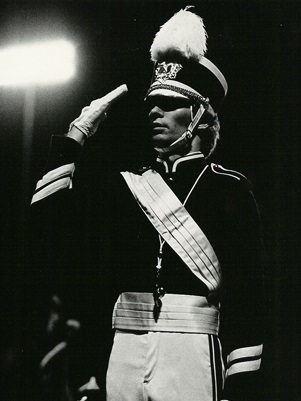 I was the second in command at the time and the senior drum major was responsible for directing the National Anthem. My job was to raise the flag as the band played. Not too hard of a task, I’d seen it done before, but too many boy scouts and civic groups had raised the flag during the Anthem, only to get to the top of the flagpole way too early before the last notes. My illusions of grandeur would not allow me to succumb to the pressure of the moment, so I was determined to raise the flag in precise harmony to “the home of the Brave” as if the pomp and circumstance was a military ceremony. As my calculated precision reached the pinnacle, I proudly saluted the flag in my starched uniform with brilliant white gloves. I couldn’t have been prouder of what I had accomplished. My moment of glory was quickly extinguished, however, as a falling object caught my eye and the gasps of the home crowd filled my ears. That falling object happened to be the glorious patriotic emblem that I had forgotten to tie off to the flagpole. My shining moment as a newly appointed symbol of leadership was overshadowed by a simple oversight of a tiny detail; a detail made apparent to everyone in the stadium that night. It was one tiny action that if taken, would not have left such a vivid memory in my mind, an undistinguishable action, perhaps, between success and failure. Unbeknownst to me, the absence of action in that moment left an impression that I still carry with me today as I work with clients. Early on in my 15-year career, I left countless meetings, only to wonder, “What did we really accomplish today?” I assume my clients probably felt the same way at times. Was our meeting an exercise to showcase my expertise? Was the client even engaged in the conversation, or did I just talk at them? Did they acknowledge that action is necessary for success? Action – Any desire to avoid financial failure and attain success must be paired with active participation from you. As a financial professional, I do not hold a magic wand, a secret answer, or clairvoyance. My desire is not to see my clients fail financially, but I cannot go at it alone. Engagement – Also known as commitment. Financial success comes from committing to a set of actions, actions that create confidence and remove uncertainty from a path, rather than blindly meandering through life and hoping that life will work out perfectly. Leadership – Everything you ever wanted to know about financial guidance is a search engine and an algorithm away. Yet people are no more prepared for retirement and the uncertainties of life than they were 50 years ago. Why is that? It’s because people need someone to help modify their behavior, to guide them down the path of seemingly endless outcomes. The events of that Friday night under the lights certainly created embarrassment, enough so that I still remember it to this day. But now as I sit with clients and discuss my role in their lives, I strive to leave every meeting with an action plan: for my team to deliver on the commitments I’ve made in the meeting, and for my clients to take the steps necessary to avoid failure. For if I don’t, one simple oversight could mean that it all comes crashing to the ground. If your advisor isn’t doing the same, maybe it’s time to take another action.